NTA-free, highly concentrated shampoo with the strongest cleaning effect, intensively dirt- and fat-dissolving. With fresh air and anti-calc. For use in industrial water recycling plants of the Autowaschstraßen. Easy to rinse, gives shining gloss on all smooth surfaces. Reduces the reuse of washing brushes. Very suitable for biological water treatment plants. 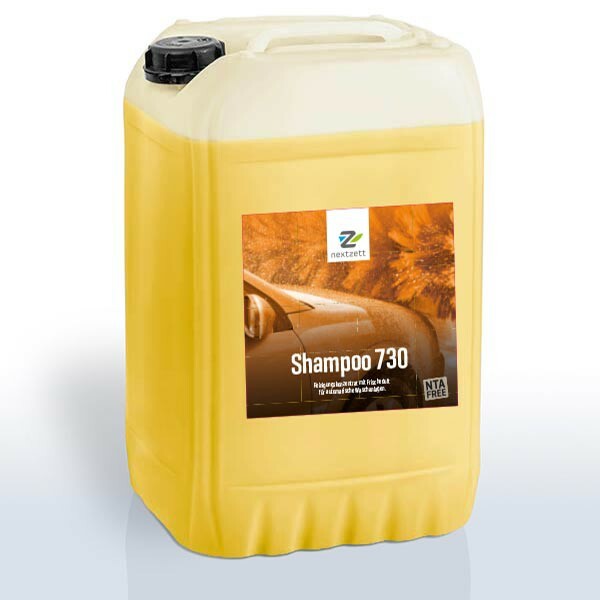 nextzett - Shampoo 730 is a specially developed for Portal plants and car washes with hot water recycling and / or highly alkaline prewash brush shampoo on the basis of ionic surfactants, complexing agents and fragrances and dyes. The surfactants used correspond to the detergent regulation 61.JB / 2001u.Jn s are biodegradable within 28 days> 80%. nextzett - Shampoo 730 is a highly concentrated shampoo of the strongest cleaning action andthus intense dirt and grease removing. It convinces with its excellent washing results and extends the service life of the brushes and textile cloth through its self-cleaning effect. Despite fluctuating domestic water quality is achieved in every season excellent drying results, as well as clean brush through the built-in anti-scale system. The surfactants used are all verywell biodegradable and behave in wastewater environmentally neutral. nextzett- Shampoo 730 is easy to rinse and gives radiant shine to any smooth surface.Shampoo 730 has been tailored to the needs of car washing systems with water treatment plants so that a good drying is always ensured and no odor problems arise in the summer. Application and dosage according to the equipment manufacturer. Optimal effect in a final dilution of 0.15-0.30 .% Use pure to 1: 3 pre-diluted via a dosing pump or pre-diluted up to 1:20 on the injector brush wash zone out. The dosage should be adjusted so that when applied to detect a slight foaming but this is the final rinse still has to be removed.